On September 7 this year, three minor girls were kidnapped outside their home in Bhangoria Goth locality of Karachi. Families of these girls originally belonged to the Awaran district of Balochistan and they had migrated to Karachi to escape economic hardships. Reportedly, the abducted girls were being held at a bonded labor camp in Khanpur area of district Shikarpur in Sindh by an influential landlord, who also happens to be a former parliamentarian. When the aggrieved families of the kidnapped girls sought the help of law enforcement agencies they did not get any positive response. Government of Sindh and other organs of government, who were supposed to help, didn’t show any interest in the recovery of these girls. Consequently, families of the girls were left with no choice but to seek the help of civil society. 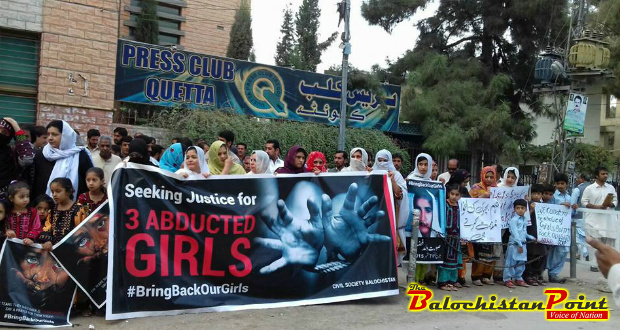 On October 15, a large protest demonstration was held by the civil society of Karachi outside Karachi Press Club to demand recovery of the abducted girls. This protest was the first major effort to bring the issue to the attention of mainstream media. However, still the government machinery was unmoved and showed no intention to take practical steps for recovery of the girls. Likewise, on October 17 another massive protest demonstration was conducted by the civil society of Balochistan in Quetta. 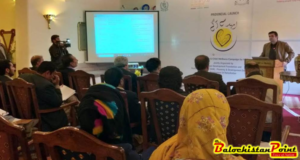 It was attended by people from all walks of life and they urged Sindh government and the federal government to play their role in the girls’ recovery. This protest received significant media coverage and as a result social activists and human right activists in Sindh and Balochistan were also sensitized about the issue and they also jumped on the bandwagon to develop pressure for recovery of these girls. What followed was continuous pressure and activism of different human rights and social groups in Sindh and Balochistan that forced Sindh Government and Sindh Rangers to take notice of the matter. The captors had no choice but to release the girls due to mounting pressure on government of Sindh to take action against them. However, the captors played their final card when two of the abducted girls aged 14 and 10 were reported to have arrived at the police station with their Nikah Nama (Marriage Certificate) and the police refused to hand over the girls to the family. These minor girls were then transported to Karachi under tight security of law enforcement agencies, as there were fears that kidnappers might target them along with their family. In Karachi, the girls were presented before the court which rejected the marriage certificates due to the fact that the two girls were aged less than 18 years. The court handed over the girls to their families and they got the custody of their children back, which is nothing short of a miracle given the history of such abduction cases in Sindh. This case proves several points that need to be pondered. It shows that government machinery in Sindh has totally collapsed in providing justice to the people. Government will only take action if it’s forced by the civil society and other pressure groups through continued protests. Kidnapping of girls and using them as bonded labor is not a new phenomenon in Sindh. Hundreds of such girls are abducted every year and not every one of them is lucky to get the attention of civil society. Another matter of concern in this context is that all the major criminals involved in kidnapping of girls and bonded labor are directly or indirectly part of Sindh government. They use their influence in the government to protect their inhumane activities and the government controlled by PPP, which claims to be a progressive party, is not bothered about it. That’s the reason why cases of kidnapping of girls in Sindh are skyrocketing under the watch of the PPP government. Moreover, it was noticed in this entire episode that there was a fierce rivalry and race for credit taking among different groups of civil society. In this particular case, five to six different groups, which included human rights groups, social groups and women rights groups, worked together for recovery of the girls – which is commendable. However, what transpired after the recovery of the girls was not so promising. Most of the organizations did whatever they could to take credit for the recovery of the girls and proved themselves to be more opportunists than humanitarian workers. A vibrant and organized civil society is necessary to keep the governments on their toes and ensure the application of rule of law. In Pakistan the importance of an active civil society is even greater, because state apparatus has virtually failed to deliver justice to people. In fact, the state apparatus is used to protect the culprits who have committed crimes against under-privileged people. 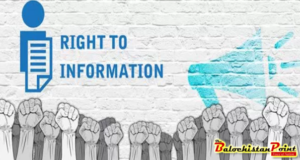 Therefore, civil society members across Pakistan should unite for protection of their constitutionally-mandated rights and that means that they have to give up credit-taking attitude. Civil society, as a pressure group, is one last hope for marginalized people and the case of three kidnapped girls proves it right.